The copper technology is becoming legacy. Over 100 years ago the Plain Old Telephone System (POTS) innovated the communication world. This network was built on copper wires and was meant to accomodate telephone calls over long distances and it was bi-directional. BUT it had a bandwidth of 300 to 3000 HZ. Even with its limitations, the POTS was succesfully delivering its services and later on it actually incorporated the fax communication. And because the technology is developing at the speed of light (see what we did here?) Telecommunication companies started to use fiber optic due to its fast speed and greater capacity. Once the network backbone started to be replaced by fiber optic, the analog signal had to be converted to digital. When the interned demand increased and people started to bring it into their homes, the already existing thelephone network was used. Modems were used to convert the digital signal to analog, but the speeds of the Internet connection were awfully slow. Later on, the DSL and ISDN technology were introduced. 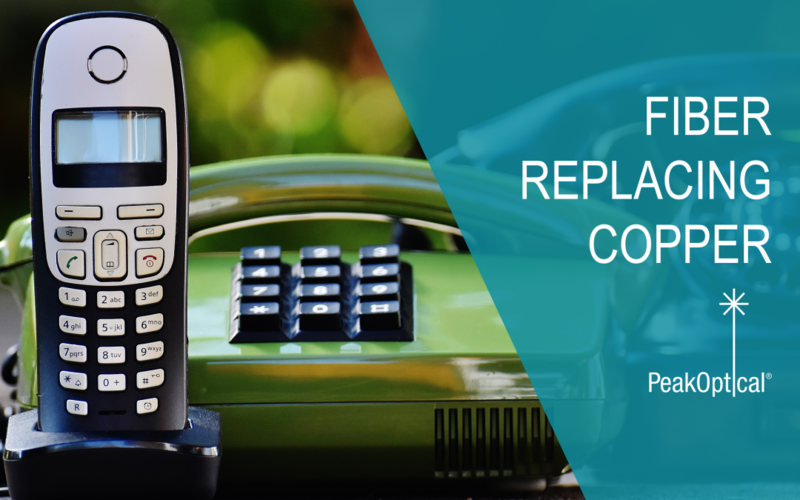 Because in the last years the demands for broadband, video, data, voice and TV and the highest speeds possible are constantly increasing, the telephone companies desire to switch to IP-based systems and eliminate the POTS for good. Although in recent years it has been said that Optical Fiber can be tapped in as easily as Copper, it’s definitely harder to get information from optical wires. It’s much easier to secure the data than UTP, and even if they pose the same threat, other benefits surmount the copper cable. It has been recorded that optical fiber can transfer up to several terabits (43 Tbps) under a single cable. UTP cable’s highest speed has been recorded by Bell Labs, with a velocity of 10Gbps. It’s definitely easy to see optical fiber overwhelming the market in a few years. In general, fiber optic patch cords require less maintenance than UTP. As a matter of fact, it’s recommended that the wires are installed and left alone (aside from normal check-ups), as some maintenance might cause even more harm to the fiber. In copper cables, latency can occur because of the repeated need of reinforcing and processing of the signals. Because in optical networks, data is transmitted by light, there is less need of boosting the data transmission. Because of lower interferences, the optical fiber can carry data under many circumstances, without losing speed or distorting it. It can resist a number of conditions, such as rain, snow or other kinds of electromagnetically interference phenomena without having the risk of data loss. It’s no surprise that optical fiber can transfer higher amounts of data over the course of a single fiber. For example, PeakOptical’s OM4 multimode fiber can transfer up to 100Gb/s over 150 meters, with 16 different wavelengths incorporated into one single fiber. Again, fiber optic can be full of surprises, but it overtakes UTP’s even at distances. With the familiar single mode cable transporting information to up to 2000 m, there’s a massive difference comparing it to the 100 m of the UTP’s. Impressive fact: there are 1.1 million kilometers of fiber cables around the world.